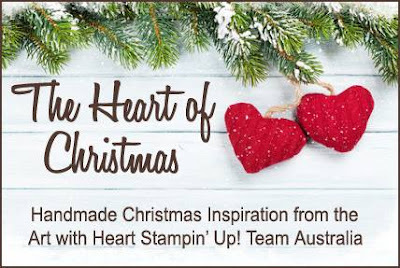 Hi everyone and welcome to week 12 Christmas inspiration with Art with Heart Stampin'Up Team Australia. 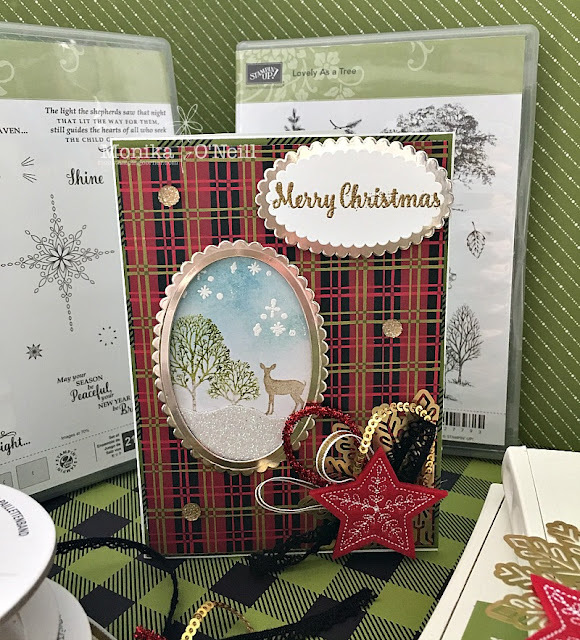 For todays card I chose Thick Whisper White Card Stock for my base, most of the card is made up of the new Christmas DSP and Ribbon which you will soon be able to get your hands on you will love it. I used the Green and Black check DSP which is from the Merry little Christmas DSP pack for my 1st layer and the Red Tartan from Christmas Around the World DSP pack for my second layer which I used dimensionals for a bit of height. The oval cut out using the Layering oval framelits, the background is whisper white and the white stars are embossed and sponged with Soft Sky and Marina mist, the trees are from Lovely as a Tree stamp set and I used old olive and crumb cake markers. The deer is from Carols of Christmas stamp set and I used crumb cake, the snow is Dazzling Diamonds Glimmer paper just free hand cut, then I went over the sky with wink of stella, and used some Gold Faceted Gems. The scalloped oval is cut from the new Champagne Foil Sheets. Embelishments, first layer is a Gold foil snowflake then topped with Black Crochet trim, Red Mini Tinsel trim, Gold 1/8 Ribbon, Gold Mini Sequin Trim and topped with a Red Stitched Felt Star. 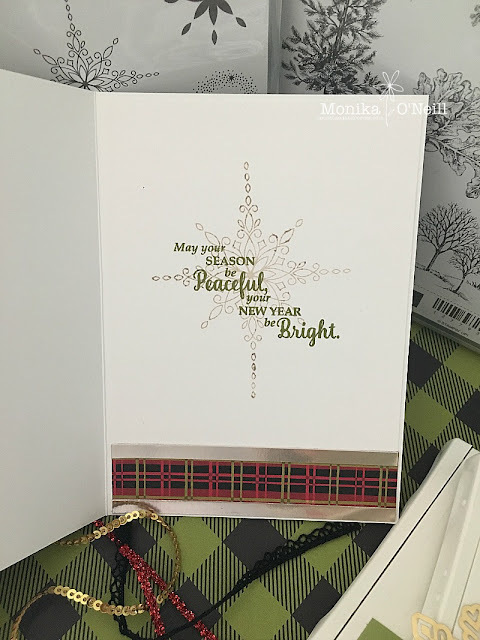 The sentiment on the front and inside of the card is from the Star of Light Bundle, I also used the layering framelits and gold embossed. Hope you enjoyed this weeks card. To see more beautiful inspiration from our very talented ladies you can view all our participants on the blog of our lovely Team Leader Claire Daly's Have a great week and will see you again with some more great cards.